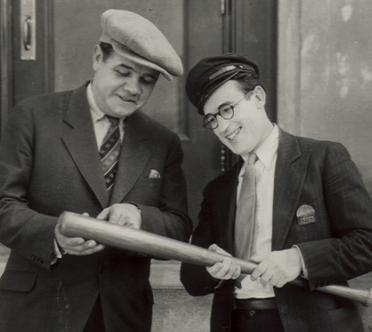 Even New Yorkers were impressed when Harold Lloyd shot a movie in their town. Speedy was filmed on location, with the Californian comedian using New York actors and landmarks in nearly every scene. Lloyd’s cameras caught the city in one of its heydays. Speedy’s New York is attitude in motion, busy and gutsy. You’ll see the real Babe Ruth; Yankee Stadium, Coney Island and the subway, all as they looked in 1928. Some of the public scenes were filmed with hidden cameras, meaning the people you’re seeing and the fashions they’re wearing are real, too. Despite being a comedy (and often a broad, physical comedy) Speedy stylizes none of its surroundings—the city is vibrant enough to carry itself. Lloyd’s character, Harold ‘Speedy’ Swift, is a normal guy with an abnormally strong love for baseball. He has a terrific girlfriend named Jane (Ann Christy); she’s pretty, level-headed and devoted, and longs for a settled life, which would be a good thing for Speedy, too. Jane’s grandfather, Pop (Bert Woodruff), drives the last horse-drawn streetcar in New York City. Pop owns the rights to the stretch of track he rides on, and gets to keep it as long as his old beater makes the rounds at least once every 24 hours. Pop’s livelihood stands in the way of a forward-thinking developer, W.S. Wilton (Byron Douglas), who tries to buy him out. When that option fails, Wilton selects force. After all, he only has to stop the service for one day. Here’s what happens: Speedy overhears Wilton planning to send his thugs onto the streetcar as it rounds its track; once on the car, they’ll stage a brawl, take control of the vehicle and dispose of it. Speedy prevents this with the help of a few dozen old codgers living and working along the streetcar’s route. (Most of them are Civil War vets looking for something to do.) The combined power of superior numbers and slapstick violence defeats the thugs. The next morning, Wilton simply steals the streetcar from its barn; Speedy retrieves it (with the help of his faithful dog) and returns it to Pop’s track with less than ten minutes to spare. In the end, Pop sells out anyway. This is all the plot Speedy's got, and it takes up only the last third of the film. Lloyd spends a lot more time on a series of elaborate, self-contained gag sequences. They’re all funny, but their real appeal is the glimpse they give us of New York City in its prime. Take Speedy’s first job: soda jerk. He’s not bad at this; he can lob a scoop of ice cream over one shoulder and right into a patron’s dish. He’s got rhythm and he works quick. But his co-workers are baseball fans just like him, and the Yankees are a hopeless distraction. The scene’s best gag involves Speedy trying to communicate a baseball score to the cooks without yelling it into the kitchen. His solution is to place donuts and éclairs (zeros and ones) on two rows of a display case, mimicking a scoreboard. When the Yankees score three runs in the fourth, he chews a pretzel to make the number. He doesn’t hold that job long, nor the next. Hired as a cab driver, Speedy manages to hook an ‘out of service’ sign on his way out of the lot, and spends his first three hours without a single customer, never understanding why. Things look bleak (and dull) for Speedy; then he sees Babe Ruth. The Bambino has spent too long giving away baseballs to local kids and now he’s got to get to Yankee Stadium, pronto. He hails Speedy’s cab. Wouldn’t you be thrilled? I would be, and I don’t even like baseball. Speedy gushes over his passenger and nearly kills them both several times, since he always looks the Sultan of Swat in the eye while talking to him. Ruth’s not a bad actor, either; he manages to look scared without overacting, even as Speedy barrels toward several large vehicles on his way to the stadium. He stays for the game, and ends up sitting behind the owner of the cab company. When a boy loses his job, buys a new suit and takes a girl to Coney Island, he’s either insane or in love—and there’s not much difference. We see Jane and Speedy (indeed, wearing a suit we haven’t seen before) boarding a crowded subway car. Lloyd delivers several good gags as his character attempts to gets Jane a seat—some seem a little cutthroat for the Speedy we’ve come to know, but whatever. The couple arrive at Coney Island and it’s on to the rides. Again, we get priceless footage, this time of an amusement park so recklessly designed that it could never exist today. For example, there’s the rippling wooden slide that ends with a sheer drop of about a foot—when you land, the back of your head is level with the boots of the people following you. Then there’s the rotating cylinder, into which Jane and Speedy climb much as a hamster climbs into its wheel. The cylinder spins so fast that Speedy trips and falls on his face. This isn’t slapstick exaggeration—in fact, it seems quite likely. Best of all is a wooden disk, about 20 feet in diameter, on which customers sit. The disk starts spinning, flinging customers off it at high speeds and crashing them into an unpadded gutter. Last one clinging to the disk wins a prize. The Coney Island sequence continues. Speedy encounters various mishaps with his new suit. He and Jane win handfuls of prizes. Eventually it is nightfall, and we see the park’s legendary neon displays. At about this point you may realize that neither character has mentioned anything about Pop, W.S. Wilton or the various threats of criminality and ruin they experienced only the day before. In fact, there’s not even one intertitle, mentioning the characters by name. And on it goes, as a mishap with a table of prizes costs Speedy all his money and they’re forced to hitch a ride home in a moving truck. What follows is a genuinely sweet scene, as Speedy and Jane move the furniture around in the back of the truck so it looks like the home they hope to one day share. It is only now, some 20 minutes into the Coney Island sequences, that Speedy and Jane again discuss elements of the plot. Nothing we’ve seen here reveals new information or otherwise advances the film. In fact, Speedy’s suit, introduced in the subway scene and never mentioned again, has the effect of making Coney Island seem divorced from the rest of the film. Though I can’t prove it, I think this was intentional. As a set of scenes, Coney Island is too long; but as a standalone short film, it’s just right. 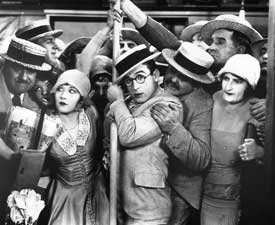 The truism (introduced via intertitle at the beginning of the subway scene) is typical of silent shorts—a universal maxim that sets the tone for the action to come. The characters, too, could be universal. The only reason they are ‘Jane’ and ‘Speedy’ is because they were so named in the previous scenes. 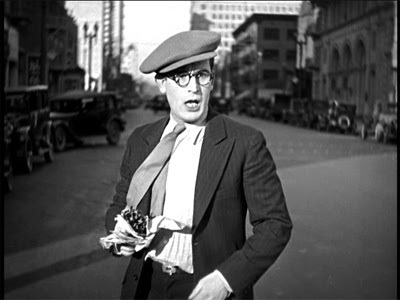 Lloyd’s appearance (clean-cut, with eyeglasses) was common to most of his films. Having Ann Christy as his co-star would not have been unusual, either, since many silent comedians worked with their female leads more than once. So what kind of a movie is this? I suspect it began in the minds of talented people with heads for business (Lloyd himself was such a man). It has humour, some romance, dramatic tension up to a point; a dog, a celebrity, a chase, danger, brawls, and an upbeat ending. It’s set in a location with infinite cinematic possibilities. Even if you don’t like all of Speedy, you’re bound to like some part of it, so no refunds required. And if ever your theatre needed one more Harold Lloyd short to fill the bill, wouldn’t these be useful? Just make a couple of cuts. I mean, they’re practically done already. And like everything else in Speedy, they look fantastic.